Spanish adventurer Alvaro de Marichalar landed in St. Augustine, April 3, after completing a tribute journey exactly 500 years after Ponce de Leon’s arrival at the same place. This journey commemorated the Fifth Centennial of the Discover of Florida by Juan Ponce de Leon in 1513. Marichalar departed Puerto Rico on March 20 and traveled 1,624 nautical miles to land on the shores of St. Augustine on his RXT-X 260 Sea-Doo. “I’m really exhausted. Tonight I’ve been sailing for 37 hours non-stop because I wanted to arrive on time,” the adventurer, who made the journey without any support craft accompanying him, said post ride. 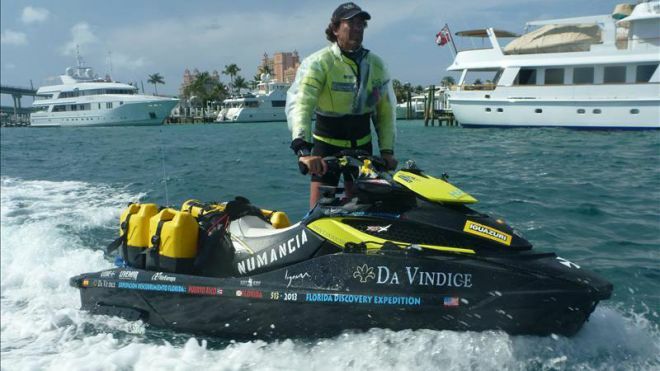 Marichalar is a Spanish businessman, mariner, speaker and politician who has conducted 38 maritime expeditions, logging close to 30,000 miles on his Sea-Doo, and has set eleven world records. In 2002, Marichalar set his first world record, braved freezing temperatures and 18-foot waves to become the first person to ride a Sea-Doo across the Atlantic Ocean, by traveling more than 10,000 miles on a Sea-Doo XP watercraft.